In the face of dramatic changes in the environment and the economy, agriculture managers are forced to make decisions involving unprecedented degrees of risk which will determine the ultimate viability of their businesses. 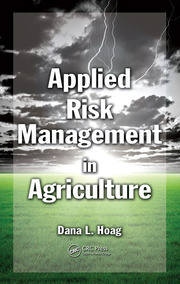 Addressing one of the most important and least understood management practices in agriculture, this book presents 10 easy-to-follow steps and a strategic framework to organize and develop a relevant and practical risk management plan. It covers strategic, operational, and tactical needs; decision-making processes; and the prediction and probability of outcomes. It is supported by Risk Navigator SRM designed to help users learn and apply the 10 risk management steps. To view sample chapters of the book,click here. To view more information on purchasing your own copy, click here. Release 1.4, Copyright © 2015 Optimal Ag Consulting, Inc. All Rights Reserved.